« Day 155 – Tommy B. Day 156 – Eileen C.
I am interested to find out how my project is received there; a mixture of nervousness and excitement is brewing. Tell all of your friends in Colombia to keep a look out for me! 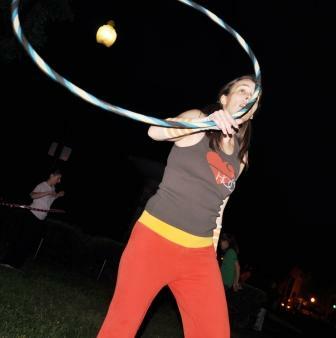 So last week I was walking through Dupont Circle when I saw a bunch of people hula hooping. There was just no way to walk by this and not stop! So I did and asked a woman there if she would accept my $10. She said yes on one condition: I had to do some hula hooping first! Let me just tell you that the last time I did any hooping (they prefer hooping over hula hooping) I was probably in Mr. Montgomery’s gym class in the 7th grade! Anyway, if you check out the video you will see me attempting to hoop. Now, hooping does not come without risk. Eileen told me she has busted up her lip and sprained an ankle in her hooping pursuits. So if you are not up for the risks, this is not a sport for you. Thankfully there is no waiver that you need to sign to hoop with Eileen and her friends though. Unlike my past experiences with skydiving where you sign your life away pretty much. When Eileen is not hooping, she is making a tremendous contribution to society by teaching. She is a special education teacher in a local school. Other than that she claims that she lives a boring life. “I have a cat and I belong to a book club…that’s about it.” She fails to mention that she is also a fire eater…fire breather…or fire spitter…I don’t know what you call it but someone who puts something flammable in their mouth and then releases it into flames. How do you forget to mention this! I mean this is really interesting! Hey, want to spruce up your next office party? Get Eileen and her friends to do a hoop dance and spit fire! Ok, speaking of fire, you might get fired…but trust me it will be a hell of a good time! Anyway…I am not going to bore you any more with my feeble attempt to convey the friendliness and talent of these hoopers…check them out for yourselves in this video! Better yet, go and join them Wednesday nights at 7:30 at Dupont Circle! You will also see Eileen giving her $10 away! That was excellent! I completely was just awestruck by the hooping that was so quick and fluid in their movement. Oh how I wish I was in DC. And kudos on giving them the $10 this day, since you are in effect helping keep Congress and the dreams of young poli sci kids alive! Way cool! Where is my old hula hoop? Cool tricks. Looks like fun! I feel like I’ve met the guy obsessed with fire before… not sure where… but I’m pretty sure I’ve met him before.